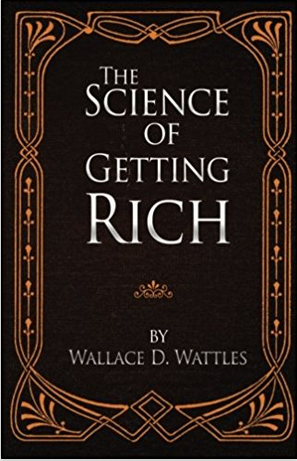 In 1910, Wallace D. Wattles wrote a book called “The Science of Getting Rich”. It has been heralded as a classic upon which the more recent book and movie “The Secret” were based. It goes along with the principles of Napoleon Hill (“Think and Grow Rich”), a contemporary of Wattles, who incites people to believe that all they have to do is follow a few set rules and they too can become exceptionally happy multi-millionaires. People desperate to become happy, healthy and financially sound, if not downright rich, will welcome these kinds of literary works, much as they do religion. It helps get them through their dire existences. Nothing wrong with that, I guess, except, just as some religions corral their sheep into ornate facades to support the greed of the shepherds, these books manipulate the minds of the unwitting and imprison them in a world of make believe for the same reasons. 4. Mental Image: “Man must form a clear and definite mental image of the things he wishes to have, to do, or to become; and he must hold this mental image in his thoughts, while being deeply grateful to the Supreme that all his desires are granted to him.” Along with this is that man must not display negative thoughts in any form or have doubts as to the “science” behind his principles. 5. Action: He must do all that he can do everyday (even in the work he is assigned, although that may not be the ultimate work that he desires to do). 6. Time: There is no time limit. Good things will come to you when the universe decides, not when you want it. 7. Resources: No resource will ever run out (not the land, nor the air, not the water, not the minerals in the earth) so don’t worry that you won’t get yours before everything is depleted. 8. Dreams: Live according to your imaginings. He uses the examples of wishing for a beautiful house and car, great clothes, etc. and states very clearly that you should ‘live in the house, drive the car’, etc. – but all in your mind. To the spiritually minded, these principles might seem to be brilliant words of wisdom. But they really aren’t that at all. They are, however, brilliant propaganda. As the United States was moving fast into becoming an industrial giant back in 1910 when the book was written, Wattles kept referring to the steel magnates – those rich greedy bastards who ruled the world and kept people under their thumbs. Today, you may as well substitute the big pharmaceutical and agribusiness industries. They’re all the same. He tells us not to worry about them. They will pass. And so they did, from the steel magnates right to Big Pharma and other conglomerates. There will always be someone or something to keep the little people in place. One-percent of the population keeps getting richer and the poor get poorer. Wattles’ propaganda is brilliant because it is designed to do precisely the same thing – keep people in their place – but without people knowing it. It’s a slight of hand, a mind-game, an illusion to make people think they are in control of every aspect of their lives and that, therefore, they can be, will be or are happy. Here is how he accomplished this. The Imaginary Life: If I live in a beautiful house filled with lovely furnishings, drive my dream car and wear gorgeous clothing but only in my mind, then I already have these things and shall wont for nothing. Except none of it’s real. Action/Current Job: I should be happy to work exceptionally hard everyday even though I am not doing what I want to do. If that’s the case then it’s unlikely I shall have the energy (physical or mental), time or resources to pursue my dreams. Once again I am supposed to be happy doing what I don’t want to do because I know I am following the principles that will lead to riches beyond my wildest dreams. Gratitude: I must be grateful for all blessings bestowed upon me. Wattles does not address how you are supposed to be grateful if NO blessings are bestowed upon you, if no money comes your way and no positive changes in your life occur. It would be very hard to be grateful for one beautiful sunshiny day when for the next week it pours relentlessly and your house is underwater. In fact, why should you be grateful for the sunshine, when it was not given to you alone. Perhaps the sunshine was meant for Joe the plumber. “Blessings bestowed upon you” must be just that – ON YOU. No Time Limit: I must follow every principle without fail everyday forever. The universe will make me rich when it feels like it. This is perhaps the most brilliant of the propaganda set forth by Wattles. It means I can do everything I am supposed to do by his measure and still not get what I want because the universe just isn’t ready to give it to me. He has already stated that I may not have doubts; I may not have any negative thoughts. So where does any of this leave me, right where I am now, unhappy and poor. But, by following his principles religiously (and I do means “religiously” because that’s precisely what it is, another religion), I can fool myself into thinking I am on the road to achieving my dreams rather than living everyday a life that’s less than optimal. I am happy to be in my place. Something better is surely coming. Will some people get rich by following Wattles’ principles? Sure. But these people probably would have gotten rich anyway due to the randomness of the universe, the same randomness that allows bad things to happen to good people. What is randomness? It’s luck; it’s timing; it’s whatever it is. And, yes, sometimes hard work and positive thinking does result in a positive outcome – with a little luck and if the timing is right (just like when the universe decides it’s your turn). The Science of Getting Rich is certainly meant for the masses. It was a very good way to develop a compliant workforce that would not agitate toward revolution. In the one hundred years since it’s publication, we have seen some of our natural resources dry up, animals have gone extinct and our land, air and water has been poisoned by barons of industry. Yet Wattles said it wouldn’t happen. And still, the same small percentage of people are rich. I wonder how Wattles would have explained all this. Shhh! It’s a Secret! This book is so dated (with Wattles talking about the great steel barons from another century) that it makes many of his conclusions false. I found a few principles worthy to digest but the more I thought about it, the more I realized it was a brilliant piece of propaganda.